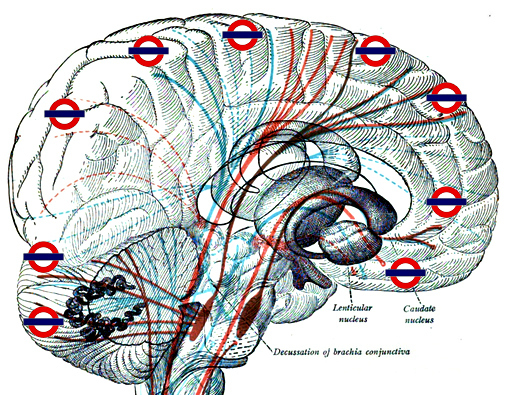 The subway of the brain – Why white matter matters. White matter has taken the back seat in the past. With apparently no use, white matter was ignored whilst grey matter was probed and inspected. It wasn’t long before white matter rose to recognition for its important role in the brain. But what is white matter? You could refer to it as the subway of the brain – connecting different regions of grey matter in the cerebrum to one another. Imagine living in a city and having to walk from one area to another 5 miles away; transport makes this much more fluent and helps make your tasks easier. This is pretty much the same for your brain! White matter is fast. This is thanks to the electrically insulating myelin sheaths (formed by glial cells) encasing each neuron’s process transmitting signals to other neurons. Nervous transmissions are quick, meaning regions of grey matter can connect and keep in contact with one another. Funnily enough, these myelin sheaths are what gives white matter its pinkish-white colour. Similar to a subway, the white matter mostly remains deeper underneath the surface with its many links and passages. Now imagine if the subway collapses or isn’t built properly – people from certain areas would have no access to these disconnected regions. The same can be said for the brain: except instead of people, we’re looking at information. Regions of the brain need to communicate in order to carry out behaviour involved in everyday life. This isn’t just a human rule, it applies to animals too. One example of this can be found in autism. A recent study, using diffusion tensor imaging, in Molecular Autism identified white matter abnormalities in autism. Most importantly, it found that white matter tracts failed to reach long distances away from the cortex. In other words, this particular train didn’t travel too far. But don’t forget – white matter can also help us get a better understanding of autism. By looking at these ‘faulty’ white matter connections, we can learn more about autism’s components and the origins of these certain behaviours. White matter disease also offers an insight into the importance of white matter in the brain. White matter disease targets small blood vessels deep inside white matter in the brain. In turn, these tiny arteries are then hardened, making it difficult for nutrients to access cells in the white matter. Until recently it was assumed that white matter disease only harmed speed of thinking – but new research has cropped up stating otherwise. Researchers have now identified 8 more cognitive deficits associated with white matter disease, revealing the disease has a more widespread effect on the brain. The deficits range from language ability to delayed memory, and visuo-spatial construction. White matter disease exacts a heavier toll than first thought, causing real cognitive damage. It’s no surprise that the disease also contributes to vascular dementia or even Alzheimer’s. We should really be cutting teens some slack. Adolescence is a tough time for most – but we often ignore the underlying reasons as to why. Youths are at a ‘critical period’ in their lives crucial for neural development, and adverse obstacles may leave lasting effects on the brain. As we grow up, experiences will shape our brains. One thing we’ll all experience is stress(if not, then I guess you’re lucky! ); you’d be surprised at the mark stress makes on the brain, and more importantly, white matter. Let’s look at the adolescent rhesus monkey and its relationship with its mother. In open access research from our Biology of Mood and Anxiety Disorders journal, researchers investigated the long-term impact of parental mistreatment on offspring. It’s a sad study with startling results. A boost in stress hormones most likely led to long-term effects on white matter. In turn, these structural changes in brain white matter were linked with social aggression, poor visual processing, and emotional regulation. But what exactly does it mean to have impaired emotional regulation? 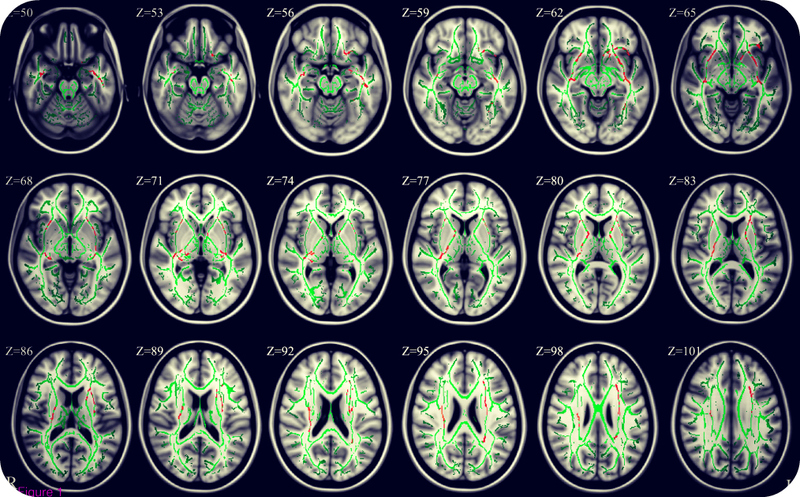 In a recent study in BMC Psychiatry, researchers took a look at white matter in adolescents. Some of these teens had been diagnosed with anxiety disorder, others hadn’t. Those with the mood disorder were found to have structural abnormalities in white matter – leading to problems with emotional regulation, which contributed towards general anxiety disorder. Diffusion tensor imaging of white matter in teens with anxiety disorders. Image courtesy of Liao et al (2014). We’ve come to the end of the blog – but hopefully it’s been an informative journey! The message to take home is that white matter research has a lot to teach us. And not all the messages are negative, nor are they final: white matter structures can change according to your environment, sometimes for the better. Just take a look at practising musicians or martial artists! Thanks for this post. Just found it after having read this new research on white matter from the Hillman lab at University of Illinois and looking more into research on white matter. There so many intriguing connections and implications to support more focused attention on physical fitness/health in our schools: http://sco.lt/7ISFPd. Thanks for reading! I remember studying white matter at uni and being fascinated by it. It really is the brain’s subway and helps different regions of the brain work together in tasks. This probably explains the thicker connections in kids who are good at sports. You need a variety of brain regions (on top of physical fitness) to be active during sports activities – hence why these white matter connections may have bulked up. White matter is thought to play a part in CFS too. “CFS patients had an overall reduction in brain white matter than healthy controls. Very interesting article! I was hoping to see the data about criminal psych, such as excess white matter in psychopaths like the teacher on TED Talks. This information was so useful to me. I’ve had several seizures and this article has helped me to understand the damage the was done. Thank you. i require more information regarding white matter disease as i was recently diagnosed.